one of the few episodes I’ve watched only once, and just watched the last third of this episode this weekend. what’s strange is that despite all the celebrity name dropping (which I absolutely hate), it didn’t annoy me as much here. maybe it’s because it wasn’t so in-your-face like they are now (i.e. compared to something like “Three-time Wimbledon-champ, Serena Williams – what are you doing here?”), and the voice acting was actually decent – maybe because they were short and fast (i.e. 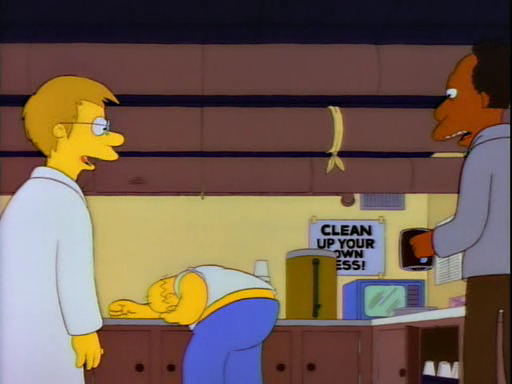 compared to some horrible readings, like the one of Ronaldo, in that HOmer-gets-a-gun episode).